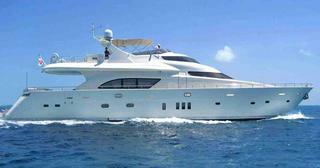 Kelli Markunas at Oceanstyle in Miami sends word that the 26m motor yacht Import III has had a near-$500,000 price reduction and has relocated from Nassau to Fort Lauderdale. Built by DeBirs in 2007 and delivered in 2008, this superyacht accommodates eight guests in four staterooms and is fitted with high-end custom lighting, silk fabrics and stainless steel throughout. She also has an on-board cinema, Trac zero speed stabilisers and her twin 1500hp MTU engines have notched up less than 300 hours. Import III is now priced at $2.498 million.